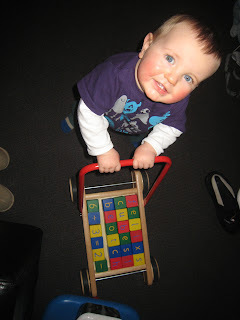 Felix received this Pintoy Wooden Walker for his first birthday from his favourite Aunty. It was an absolute hit from day one. 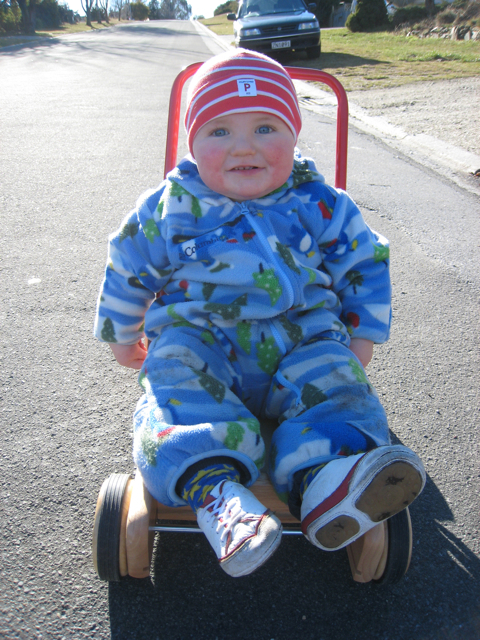 As Felix didn't start to walk independently until he was 15 months old, he loved having this walker to help him get about. We used to go for short daily walks with it. Granted it took us about 15 minutes to go 20 metres from the house and back again but the smiles and Felix's sense of achievement was totally worth it. 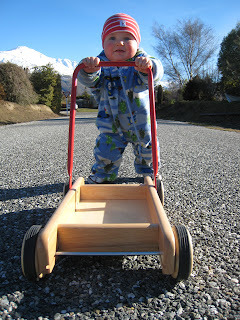 The walker has a bit of weight to it which makes it lovely and steady for young toddlers. Felix was able to use the walker to pull himself up to a stand and then lean on it quite a bit while walking. It is also very strong so if he got tired of walking before we got back to the house, he could sit in the walker while I pushed him. Sometimes I think he just faked tiredness as he so enjoyed this aspect of the toy. The downside of this sturdiness and weight is that it is a difficult toy to maneuver in tight spaces. Our house is quite small so there was a phase where Felix found it frustrating to try and turn the walker. He needed a fair amount of supervision and help during that time but he soon learned how to 3 point turn and was delighted with himself. Now that Felix is a little older and he is such an avid reader, he is showing a lot of interest in words and letters. In addition to stacking the blocks, knocking them over, taking them out of the walker and putting them back in, there is the opportunity to learn colours, numbers, and letters. We also spell out familiar words that he can pronounce. So far he can recognise dog, ball, moon and cat. At 21 months, Felix still plays with this most days of the week. I envision his interest in it lasting a lot longer and I can definitely see Dexter being pushed round the house in it when he is older. Do your wee ones have this walker? How do they enjoy it? Or do you have a different type of walker you love?